Using a sand wedge around the green is vital. The most difficult shot for most club golfers is to play a little shot over a bunker. The sand wedge is the heaviest club in the set. If you mis-hit the ball it travels too low and too far. 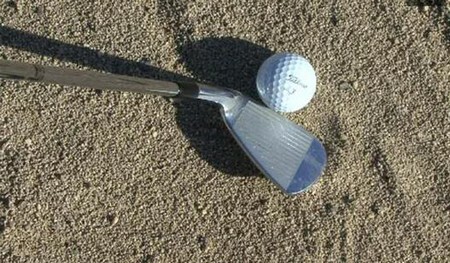 It is important to make friends with your sand wedge and to have confidence in producing lofted shots. 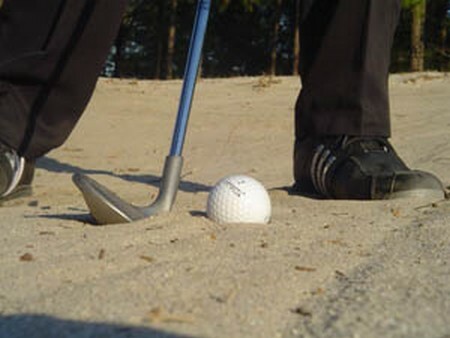 To acquire confidence with your sand wedge, practice from 45cm or so from the edge of the green. Lay a putter down on the green no more than four paces away. Learn to play tiny shots, all finishing short of your putter. This is much shorter than shots you would ever really play, but it teaches good habits. Use the reverse overlap putting grip with the left index finger on the outside. If you wear a glove you shouldn’t see the logo on the back of the glove. If you don’t wear a glove you shouldn’t see any of the knuckles on the left hand. The putting grip adds firmness in the left wrist. The club is 5cm (2in) shorter than the 7 iron; grip near to the top of the club. Sit the club flat on its bottom. Remember that the whole idea of the putting grip is to keep the clubface working through in a face up position. It also slows down the wrist action. To make the ball rise the club must bounce on the ground as it strikes the ball. Before each little shot have one or two practice swings and feel the club bouncing. In this way you find the bottom of the ball and avoid hitting it halfway up. To feel the bouncing contact, sit the ball on a fairly large coin and concentrate on striking the coin. If you send the coin away the ball will rise. The wrong action is of letting the left wrist collapse in an effort to help the ball into the air. The correct action is to keep the left wrist firm and leading. It mustn’t stop through impact. If your left wrist collapses, try, as an exercise, gripping further down the club. In this way you can feel the top of the clubshaft against your left wrist. Hold it there through impact and beyond to encourage the bouncing contact and firm left wrist. Most golfers ruin shots with a sand wedge by looking up too quickly. The reason for practicing with such a short shot is that the ball is always within your vision. You can see the ball out of the corner of your left eye. Learn to play these very small shots, staying down without letting the head or eyes move. Learn to lengthen the shot by pitching over your putter. Learn the feeling of staying down. You will know whether you have hit the ball correctly without looking up. Give yourself 5 points for a perfect contact and zero points for a horrible contact. You will know how good the shot is without moving your head or eyes. As you lengthen the shot keep your shoulders level – the high right shoulder – and simply work at the bouncing contact and firm finish.